Gerard McCabe has long had a passion for interesting jewelled creations. 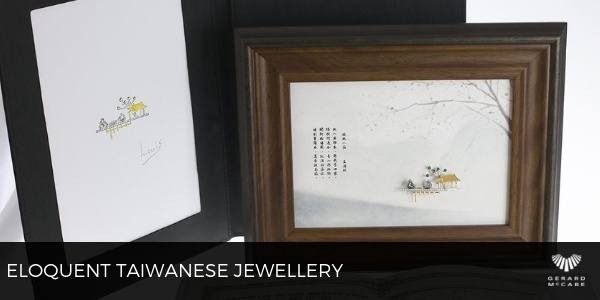 On a recent trip overseas, his interest was sparked by the wonderful Taiwanese Jewellery he discovered. These frames hold marvellous jewellery, each a representation of age-old passages. Gerard brought back a collection of these framed pieces. With the ability to wear them, and store them within the frames, they’ve already sparked interest from visitors. Unlike anything we’ve seen before, these are a wonderful depiction of jewellery and how artists can tell stories through each element. My friend has prepared a homemade feast and invited me to join it. The green tree was around the village, the emerald mountain was around the tree. We opened the windows and cheered for the harvest this year. I hoped I could come back to visit my old friend again. We could drink the wine and enjoy in the blooming garden again. The brooch itself is a representation of the poem and alludes to the story of friendship. 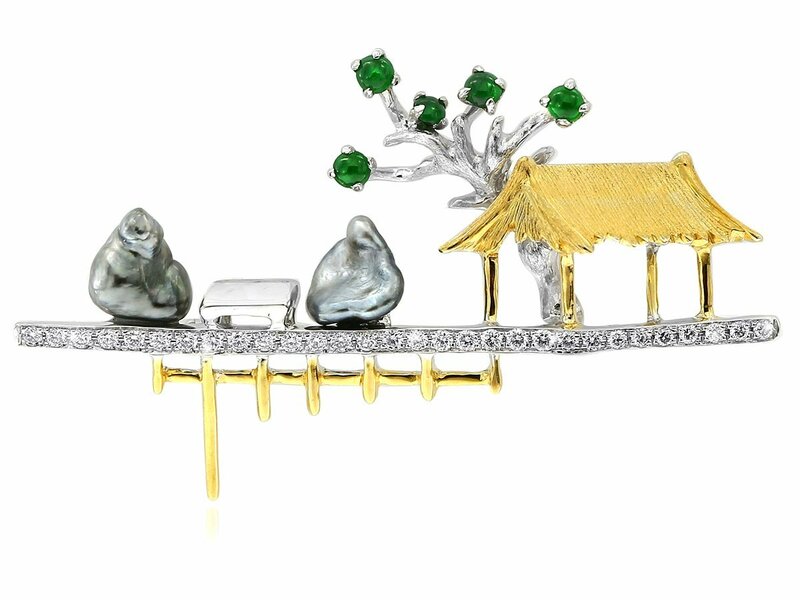 Incorporating a collection of elements, the gemstones appear as if they are the two friends, sitting enjoying the feast, within an Oriental village scene. It’s a wonderful celebration for Taiwanese culture and speaks true to the poem itself. In the spring, the mountain is as pretty as beauty’s eyebrows. Flowers are blooming everywhere and green leaves are around me. Walk by the river which Orchid is blooming. You could see birds sleep silently under the sunshine. The horse wearing the golden blanket is walking slowly. I hold the whip by the river, enjoying the breezy day, and go through the bridge and willow tree. When I come back to home, the golden oriole is on the tree under the sunset. This brooch represents what is described within the poem, using gemstones and intricate detailing to depict the springtime. The array of gemstones used, and colours included, add to the interest of this piece. The same artist has created others that Gerard selected to bring back to Australia. These pieces have received great interest both instore and online, with many blown away by the array of gemstones incorporated. Unlike any other ring, the Tourmaline, Opal & Diamond Ring exudes an array of magnificent colour. Tourmalines, opals and diamonds combine to create an offset cluster ring that is truly breathtaking. The pave set diamonds only adding to the shimmering effect of this one-of-a-kind piece. Gerard McCabe invites you to come instore and discover these unique and interesting creations. These are on display, and available for purchase, at our Rundle Mall boutique.